"We just finished the depressed version of SG and everyone wishes for a 24th episode, what shall we do?" "I know what to do! Let's give them an empty and silly Valentine's Day episode!" Story: There is not much to say about the story, it is Valentine's day and every goddamn girl, who played a role throughout the series, decided to join the fiesta. It felt boring, empty and the jokes were so bad that I wanted to cry. Hell, they even lewded our innocent cinnamon roll Mayuri. The only good thing about the OVA are Hiyajo's and [Kurisu's] interactions, especially the last scene had at least some significance to it. I had high expectations, but those were shattered beyond repair. Art and Sound: The art looked good, was consistent and we got a "funny" shot of Faris but to be honest, this level of art was expected and is nothing special. The sound was not special, but I guess that it fits the tone of the story. Sadly, they used the wrong opening/ending, the first opening and the second ending, which is nothing but a minor error, but really shows me how little work went into this OVA. Enjoyment: There really was none, except seeing my favourite characters and the post-ending scene. The whole idea of a silly Valentine's day episode instead of a real sequel is probably the worst possible choice and is not understandable for me. It hurts to say it, but this is as bad as Steins;Gate gets and what makes it even worse is the fact that this is probably the last bit of Steins;Gate we will ever get. I feel like I entered an alternate universe. Forget time travel in this special. What you'll find instead is an episode of anomalous shenanigans in the form of Valentine, sweets, and what? I should probably backtrack and bit and explain. Before actually watching this, I'd suggest avoiding watching the trailer on MAL, Youtube, or wherever you get your Steins;Gate news. That way, you'll feel the sweet little surprise this special awaits you. With that being said, a Valentine special episode like is pretty much a gift that's ready to be consumed. The creators knew that the original series and its sequel had a moody story. So what's a little harm to craft something out of their comfort zone? My first impression of the special had me wondering who would even show up. And to my delight, the majority of the main cast decides to enter this series with a vibrant mood, a contrast compared to the previous series. Hell, even Alexis regained his sense of sarcastic humor that I adored. 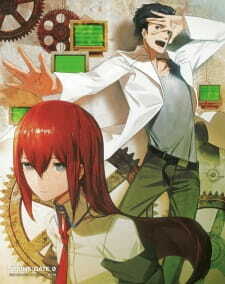 Of course, the other main cast I'm referring to includes Okabe and his friends, lab members, and goofballs. Pay attention to the comedy though as I'm sure the creators were aiming to make the audience laugh. Did it succeed? To be honest, that's an ambigious question. I think anyone who has seen this and without even half way should realize that it's not to be taken in serious nature as the main plot. There's essentially minimum storytelling as this special episode serves as a standalone OVA. While the overall context has connections to their world, it doesnt signifcantly impact any of the main story. That still brings back to the main concern if you should watch it or not. What I see this in this special episode is a ball of humorous gags bouncing up and down. We have characters like Ruka in a ridiculous outfit, malfunctioning microwaves, and mob of maids. In essence, the special celebrates the comedy side of the show. It serves as a way to remind us a popcorn entertainment side of the franchise. With 23+ minutes of content, it's not here to go deep into the plot. So be open minded and accept this like an obligatory chocolate. One may look to me and question, "PeliCan, is this episode of Steins;Gate 0 really as low as a 2/10?" And honestly, my answer is probably no. I have seen plenty of stuff that's much worse for my eyeballs and brain. However, very few pieces of media have left me feeling so hollow and empty inside. I really hate Steins;Gate 0, it dumped on everything I loved about the original series and I still regret even watching it. In retrospect, it may have even slightly tainted my feelings towards the whole franchise in general. However, this is not a review of S;G 0, it is a review of this pointless and annoying episode. What this episode has done is ignore any issues or plotholes left open at the end of S;G 0, and instead of taking the time to clarify them, it gives us this pointless piece of fluff. Most of it is entirely predictable and annoying and acts as a way to show of the show's colourful cast of bland sheets of paper they call girls. I am constantly reminded why I hated characters like Kagari and their general treatment of Suzuha. The colour scheme and direction remains drab and ugly without using their chance to brighten things up for a Valentines Day Special. The fact that a special all about love looks exactly the same as scenes of people getting their heads sliced off and characters dying doesn't speak well for either situation. Along with this, the music remains unnotable, and the plot had me bored out of my skull. The worst episode of the original Steins;Gate was about love, (The Episode where Okabe went on a date with Luca) but it was still fun and engaging. This OVA just dragged along and remained incredibly pointless. I know a lot of people will probably like this OVA, as S;G 0 remains incredibly popular and well received. I will give this episode credit for being a nice mood lightener after what happened in S;G 0, but otherwise, there is little merit here. The comedy falls flat, the characters remain sterile and gross, and all this does is sit as a reminder of why I hated my time watching Steins;Gate 0. That is why I'm sitting here, asking myself again, does this OVA really deserve a 2/10? And now I can't help but change my answer to yes. Yes it does. Not because it has no merit, but because of everything it represents and stands for. I loved Steins;Gate, but I hope that it never receives anymore spinoffs or animes ever again. This episode is an OVA that doesn't relate to the main story, bundled with the 6th anime DVD, a refreshing one , It was the funniest episode from a long time , aside from time travel and what is awaiting okabe in the future ( the mad scientist distress ) , this episode main focus is about valentine day, where the most scenes are purely comedy ones or fan service ( lukako wearing maid dress ) . This episode is a little reminiscent to the lively ones that we used to see in the first season of steins gate. There's nothing new to expect, the same as the the latest season ( same opening and ending ) , but the opening still impact on me till now .